Bozza, Julie (editor). 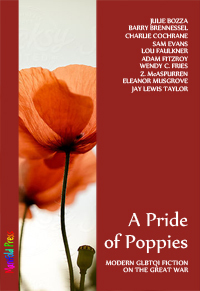 “A Pride of Poppies: Modern GLBTQI fiction of the Great War”, Manifold Press, 2015. I have been sitting on my review of this book because I wanted to publish close to the date of publication so now I am feeling comfortable about posting it. The idea of the anthology looking at the different ways that World War I affected the LGBTQI community is novel. I was surprised to find some author whose works I have previously read and reviewed along with those I met here for the first time. Usually when I review an anthology I look at the work as a whole but this time I am going to go story to story. The book opens with Julie Bozza’s “No Man’s Land” in which we meet Drew who is turning twenty-one and considered to be an adult male. Every year he has a medical exam on or near his birthday and he has always hated them so now that he is an adult, he has decided that there will be no more. He has decided that he will not use the letter that his doctor has written for him so that he will not be drafted—he wants to join the service even though his lover and partner Henry (who has been to war) tries to convince him not to do so. Drew wants to serve his country even when he is being pulled in the other direction. There is much more to this story than I can tell you know but it will keep you reading from the very first sentence. We read of time moving forward in “I Remember” by Wendy C. Fries. We meet Christopher and James, best friends who have done everything together their whole lives who are not allowed to enlist in the service together. Jamie was alright but the British army said no to Chris and not because he could not hear (he had been born deaf); there was no specific reason given. Chris goes off to war and Jamie is worried that he will be forgotten. However, Chris is sure that won’t happen and the two exchange letters that only they can understand speak of the love that they share. This is a beautiful story of desire and longing that beautifully reflects time and place and the misery of separation. The pain of separation is also one of the themes of “War Life” by Z. McAspurren. Here we have a brother and sister. Everyone is sure that each of them has someone. Maybe she loved Patrick, her family friend who lived right down the road but that was not true. She was actually worried about her brother who went off to war. Actually brother and sister only really felt safe when they were together. In fact it was her brother who loved Patrick and they were off in France together. What happens next is for you to discover as you feel the effect the war had on a brother and a sister. Julie Bozza shares another story, “Lena and the Swan or The Lesbian Lothario” where we meet Lena Pearce, the postmistress who is something of a tomboy with attitude and who has decided that since the men are gone she will have a good time. She does just that with some of the women that she entertains when she brings their mail. But then a new woman comes to town, a Miss Cawkwell who is thin and lacks coordination that Lena is charmed by. I am sorry to leave you hanging but I do think you would prefer it that way. Eleanor Musgrove’s “Inside” is the story of Alfred Schuchard who ran his family’s bakery before the war and before he had been captured and held at Alexandra Palace interment camp. He had been at the camp for six months and then Viktor, a new prisoner was put in the bed next to him. The two men share a German background—Viktor was a German student studying in London while Alfred’s family had Germanic roots. Alfred comforts the young German who is totally upset about his interment. Where this goes will surprise you. Two men, Second Lieutenant Jay Lewis Taylor and Captain David Russell-Hansford-Barnes meet in no man’s land in Jay Lewis Taylor’s “Break of Day in the Trenches”. The two have been hit under debris and they speak to each other recalling their families and facts about their pasts and it is so interesting that they might never have come to know each other had the war not taken place and had each not forced to face his own mortality while being pinned down with the other. Lou Faulkner’s “Per Ardua Ad Astra” uses the motto of the Royal Air Force as its title. Set in 1916, we get a look at what life in the force was like back then. In “The Man Left Behind”, Eleanor Musgrove’s story we meet Henry or Henrietta, a man who is trapped in a woman’s body and who is unable to identify with the way he looks. Having always been something of a tomboy, she wants to go to war with the rest of the men yet she knows she can’t. Her brother Peter manages to find his sister work on a farm where she can dress and work as a man and it there that she meets Rosie who know she was actually a female. This is quite an interesting look at a time when transgender was not accepted and when little was k known or understood about it. We are taken to the trenches in Charlie Cochrane’s “Hallowed Ground” and there we meet a doctor and a man of the cloth. In war, death is always close and while one of the man is spiritual, the other is scientific. The father (Padre) worries for the doctor who seems to have no faith. Here are two men who just might be facing the ends of their lives and we read how they deal with that and each other. “A Rooted Sorrow” by Adam Fitzroy introduces us to Mrs. Mercer and Miss Woakes, two women who would enjoy tea and conversation together. Mercer is a widow whose only son, Simon, was killed in the war. Alfred, his friend, came home with hands ruined by battle and blind. Simon and Alfred loved war and each other and Simon had kept meticulous notes about the times they spent together. Simon’s mother takes those diaries to Alfred even though she knows he cannot read them and thinks that perhaps she can read them to him. Here is a story of those who stayed behind and lost their loved ones. As Simon’s mother reads those diaries to Alfred we get quite a look at the way things were once and this is a beautifully well-written story that makes us weep as we read. Jay Lewis Taylor also gives us “At the Gate” and this is about Sub-Lieutenant John Davis the ship’s doctor on the Arion. Lieutenant-Commander Alan Kershaw is his senior officer and the ship’s surgeon and had once been the best friend of Davis’s uncle Grant who was lost to war. Because of his uncle, David joined the navy but he did not know of Grant and Kershaw’s relationship or that they were lovers. When the assignment to go to Zeebrugge came through, Davis start to feel nervous. Kershaw is taking care of his as he promised Grant to do and he senses the nervousness. Where the story goes from here you can find out by reading it. Doctor Robert Wallace is the main character in Sam Evan’s “After and Before”. The nurses all take good care of him. Sam has not had an easy life and because of a motorcycle accident there are braces on his legs and he needs a cane to walk. He has done ok so far and now he is serving his country by taking care of soldiers injured in the war. They come to him at his family home. As he thinks about his life before his accident, he shares those thoughts with us. He remembers how disappointed his father was when he had the accident that made him ineligible to serve in the army. He never really accepted this and it bothers him all of the time. Were it not for his lover Will, his life would be total misery. Will is a worker on the family estate and the two men have been together some fifteen years. Before the war they spent a lot of time together but there came one night when Will tells him that he has enlisted. Robert really does not want him to go and it hurts that he cannot go as well. Once again we get a look at the war from those who stay behind and the fears that they deal with. The final story “Anh Sang” is by Barry Brennessel, the only author in this group that I had read before, His is also the only story not set in Europe. It captures innocence beautifully. It all began when Minh helped another boy chase a pig. The boy, Ngo Cong Thao lets the pig go free even though he knows that his father will punish him. The pig was merely an excuse to bring the boys together and here began a romance. The story moves forward to 1917 with the war raging in Europe. They are now both twenty-one years old and they are now able to tell each other how they feel. Again, I do not want to spoil the read for anyone so I will stop here. This is an anthology in which every story is an excellent read and a look at an age that none of us experienced personally. This entry was posted in GLBT short stories on April 19, 2015 by Amos.